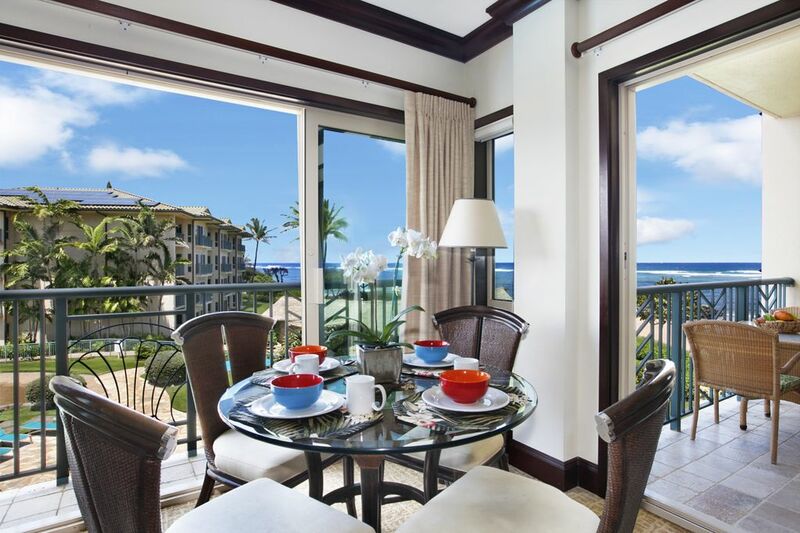 One of Waipouli Beach Resort’s most incredible corner suites, this third-story oceanfront location is spacious, luxurious and absolutely stunning! With sprawling sea vistas by day and torch-lit tropical pool views by night, your surroundings are purely paradise. Featuring two king beds and a queen sleeper sofa, this suite can comfortably accommodate 5-6 people. The stylish interior includes a stately kitchen with a Wolf glass cooktop & oven, Sub-Zero refrigerator, GE profile microwave, Bosch dishwasher, granite counter tops, African Mahogany cabinets, three full bathrooms with Peruvian Travertine stone surrounds and soaking tubs. Enjoy the clean design and convenient location, with the beach and boundless Kauai adventures just beyond your private lanai. 5 star luxury for less. Really enjoyed our stay at Waipouli. Paid extra to have a unit with a great view and it was well worth it, but the property is good no matter what unit you are in. Just some have no view at all. The salt water beach is unsimable because of the coral, but relaxing to sit at the beach since there are no screaming kids in the water right in frontof you. There is a swimable beach park about a mile away, but parking is very limited there. Restraunts within immediate walking distance are ok, but nothing special. The menu at the restaurant at the resort could use some dumbing down. Wpud have liked some sliders and onion rings, but no joy. Only had one problem with the unit (the floor safe) and management responded very quickly to address the issue, so thanks for that. We have stayed at your resort 3 times now since 2014. We always enjoy the resort for its location and amenities. We did notice this time that the room we stayed in was a little run down from years past, being million dollar condos I would expect better maintenance in the rooms and exterior. Washer / dryer need maintenance or replaced the screen doors are falling off the rails and are inoperable which is also a safety measure. The sliding door was very hard to open & close. Furniture very poor in living room chairs are showing signs of mold in the cushions and just in general worn out. What a wonderful place to stay. In the heart of everything on Kauai. Wonderful pool and grounds. Five stars! My wife say one bug in a bathroom drawer, but only once. Kind of to be expected in a tropical place. The rooms were great, and the kitchen was fabulous. Can't say enough good about it. Our stay at the Waipouli Beach Resort in unit H304 was fabulous! We were there for a week and this unit was so nice to come back to every day after our adventures on the island. The unit was exactly as pictured, with excellent quality furniture throughout. The kitchen is very well equipped; we even had spices, foil, and leftover storage containers during our visit. The unit came stocked with plenty of toilet paper, soap, towels, and even laundry soap. We enjoyed sunrise from our balcony most days, but did walk down to the beach one morning with our Kauai coffee, which was provided upon our arrival. The on site restaurant has some delicious food and drinks! The pool area at the resort is perfect for a day of lounging around. The location was convenient for all of our touring of the island. The walking distance shopping center across the street has a great Safeway grocery store, a Starbucks, a nail salon (where we enjoyed deluxe pedicures), and many more shops. We did have one maintenance issue that was resolved by the end of the day simply by calling Kauai Exclusive. We would not hesitate to book this unit again! Lovely resort, and unit, only negative is that the beach is dirty.